Hopefully DJ Hero Will Come With Strobe Lights & A Kaoss Pad. Well it only felt like an hour ago we were posting rumours about DJ Hero (it was under an hour ago - Ed). But now it's all official. As are Band Hero and Guitar Hero 5. Activision claim the games will "redefine the company's popular music gaming platform" and "transform the way consumers enjoy and engage with music." While we are really optimistic about DJ Hero - because it could genuinely be something different - we're much more sceptical about how much more Activision (and Harmonix) can milk from the music genre. Guitar Hero 5, Band Hero, The Beatles: Rock Band, Rock Band Unplugged, gah - how much more of this stuff can people take? 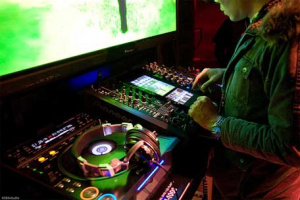 Anyway, ready for details: DJ Hero features will expand social gaming to all new consumers with diverse music genres including hip-hop, R&B, Motown, electronica and dance. Remember we said we were sold earlier? Well now we're seriously sold. MOTOWN! DANCE! ELECTRONICA! Finally, a music game for us that's worth our time. Guitar Hero 5 will include both modern and classic rock bands and give players an "unprecedented level of control over the way they play the game with the ability to drop in and out of songs and change band members, instruments and difficulty levels on the fly". Urgh. Don't care about that one. And what of Band Hero? That's for the younger crowd. The game will have an E10 rating and feature top-40 hits designed to appeal to a family audience. The game will include guitar, drums, bass and microphone. So in conclusion, we don't care about Guitar Hero 5 and Band Hero. But, dude, DJ Hero - amazing. Coming this fall.